Portare un buon libro, macchina fotografica, o canna da pesca. Questa cabina accogliente si trova fuori dai sentieri battuti, Situato su una sidehill accanto a un ruscello di montagna tortuoso. Il ponte è parzialmente schermato e una griglia è previsto per la cottura all'esterno. Una serie di passi che si prende verso il torrente dove c'è un anello di fuoco per il falò serale. Tutte le basi sono qui, pentole, padelle, piatti, fornello a gas, frigorifero, forno a microonde e camino a gas. Un letto matrimoniale in camera da letto, divano e divano letto singolo nel soggiorno. Dovrai portare la tua biancheria e cibo per il tuo ritiro rilassante. Abbiamo messo in vendita legna da ardere in vendita nel nostro negozio sulla Route 220 South of Dushore. Setting is wonderful. Enjoyed sitting by the fire watching the stream. Cottage is clean and very nice. We enjoyed the break from the world. FYI : no bad smelling water as mentioned in other reviews. Would love to return during the summer. Highly recommend as a “get away”destination. This little cabin was perfect. It was a bit cold in the main living area the heat didn’t seem to work well and the gas fire place was either out of gas or broken, we couldn’t seem to make it work. But the rest made up for it! It was all we needed for a two night stay. So quiet and peaceful right on the creek out back. The fire pit was perfect! Would definitely stay here again. Would recommend. The cabin was cozy, clean, and comfortable. Only thing that would have made it better was if we’d have seen some bear. Thank you for allowing us to stay in the Little Cedar! We plan to be back! A very cozy cabin in a secluded spot. This is a very cozy cabin in a secluded spot. We wish we had more time to stay there. We met RIchard in person. He was very friendly and helpful. The cabin could use some updating and some changes, which Richard said that he will be making. Once that is done, this will be a 5+ spot!! 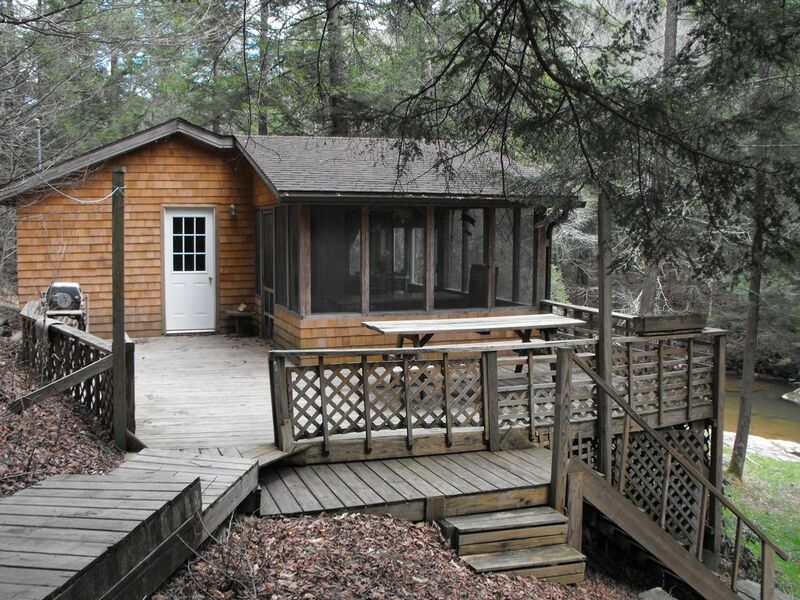 We will contact you to stay in one of your cabins the next time we are in the area. Con nella guida distanza di Worlds End State Park, e Ricketts Glenn State Park.
."Renter assumes responsibility for acquiring or not acquiring Trip Cancellation Insurance."